Congratulations! You have been elected to the public hospital board. Now the board secretary handed you a notebook of past agendas, and board minutes and asked you to chair next week’s scheduled board meeting - what do you do now?! 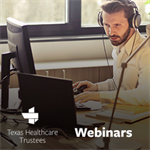 This webinar will focus on the key things public board members need to know to comply with the Texas Open Meetings Act rules for agendas, quorums, meetings, closed sessions, and the appropriate minutes for each. The session will also address top issues for responding to public information requests under the Texas Public Information Act. Fletcher Brown is a partner with Waller Lansden Dortch & Davis, LLP. Hospitals, health systems, physician practices and other health care providers throughout Texas rely on Fletcher Brown for assistance with operational and regulatory issues ranging from contract negotiations to Stark, anti-kickback and HIPAA compliance. Fletcher is Martindale-Hubbell AV Preeminent Rated and recognized by Chambers USA as a leader in Texas health law. He is also board certified in health law by the Texas Board of Legal Specialization. He has invested significant efforts with the Texas Medicaid 1115 Waiver program which has helped hundreds of Texas health care providers receive additional funding to expand risk-based managed care statewide.